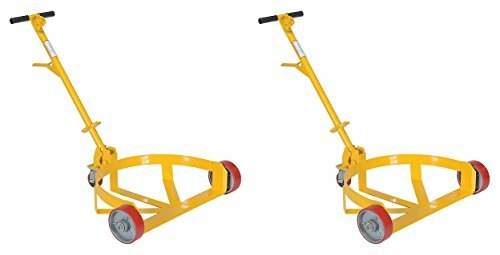 Reduce injuries caused by manually lifting and moving drums. Transport (1) 55 or 30- gallon drum or (2) 5-gallon pails with the Lo-Profile Drum Caddy. To use: align unit in front of drum, remove handle, and grip drum with the handle. Tip drum up while guiding the caddy base under the drum. Re-attach handle and transport drum to desired location. Unit rolls easily on two 6" by 2" rigid wheels and one 3" by 1" swivel caster. The removable handle doubles as a bung nut wrench and seal remover. Cradle height is 1/2". Inside cradle diameter is 23-1/2". Steel construction. Yellow painted finish.